As I have been working in the office more, I’ve started to think more about how to organize the office space to enhance the collaborative nature of our work. 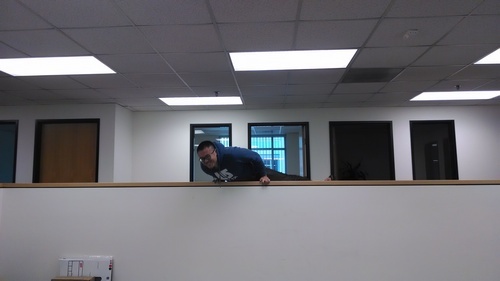 A few weeks back, we were re-arranging our desks and I noticed how heavy they were and how un-conducive they were to refactoring. They are L-shaped desks with the two sections held together by two meager screws and a metal plate. Yet they were so heavy and unwieldy as to make them extremely difficult to move. The thought occurred to me then why Ikea Galants are almost universally the office desk of choice for startups: they’re cheap, they’re sturdy, they’re easy to move, they’re open, and they’re extremely hackable. 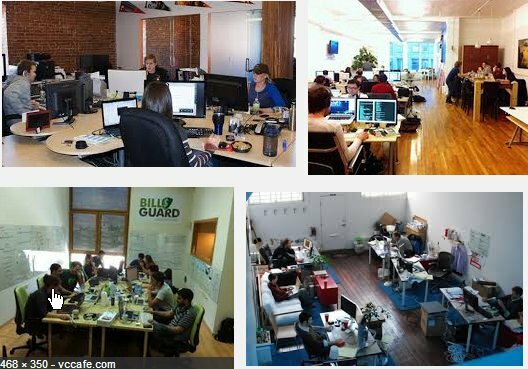 Google image search results for tech startup office. But beyond just the hardware, I’ve been thinking about how to improve our team’s ability to collaborate as we are in a period that requires highly coordinated design and development to hit our very tight timeline. One of the first things we did was cluster the core team members into one area of the office so that it’s easy to turn around and talk to anyone and so that all members of the team can hear and jump in on any design discussion. This has downsides, of course, as it can get noisy and it can be difficult for other members who need to concentrate. However, my thought is that we should reuse the office rooms for private “thinking” or call areas with standing only desks (no seats) so that individuals who need temporary peace can move into an office but not get too comfortable. My other thought has been that it is extremely important for the leaders, founders, CEO, president — whomever, to sit with the team. The reason is that these decision makers need to know what’s going on — especially so in a startup — and it’s difficult to do so if their time is spent behind closed doors away from the action. Of course, there are times when important phone calls must be made or private discussions must be had, but again, the concept is to reserve the closed door rooms specifically for this purpose and only with standing desks. An even bigger intangible is that having the leadership on the floor sets the tone for the team. In fact, I sit with my back facing my developers so that each of them can see what I’m working on and what I’m not doing. I’m not on Facebook, I’m not randomly browsing sites, I’m not sitting idle. I think this has a motivational effect and helps the team realize that we’re all in this together to make the magic happen and that I’m not asking any more of them than I am of myself.